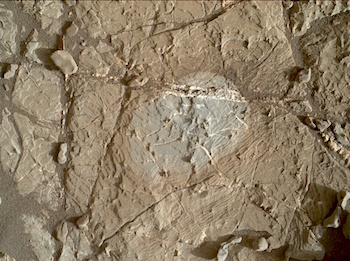 Sol 1937, January 16, 2018, update by MSL scientist Rachel Kronyak: Today we’re continuing our science activities at the Vera Rubin Ridge (VRR) location “e.” It certainly seems that “e” should stand for “exciting,” as we’ve collected quite a rich set of observations at this location, including extensive imaging and geochemical analyses. In today’s plan, we’re focusing our attention on small-scale features in the rocks in front of the rover to try and understand how they formed. We have a nice long science block in the early afternoon, during which we’ll use ChemCam to assess the targets “Macleans Nose 2,” “Funzie 2,” and “Ullapool.” The targets with “2″ in their name are intended to be repeat observations of targets that we analyzed over the weekend to gather additional information. We’ll then take a small Mastcam mosaic to document some of the VRR terrain further away from the rover. This entry was posted in Reports and tagged Aeolis Mons, Curiosity, Funzie 2, Gale Crater, Location e, Loch Maree, Macleans Nose 2, Mars Science Laboratory, Mount Sharp, MSL, Murray Formation, NASA, Region e, Rona, Stop E, Ullapool, Vera Rubin Ridge. Bookmark the permalink.